2/1/2019: Happy Friday from Forcella BYOB. We are excited to present our 2019 Valentine's Day menu. This dazzling menu will include 6 gorgeous courses as well as amuse and intermezzo. 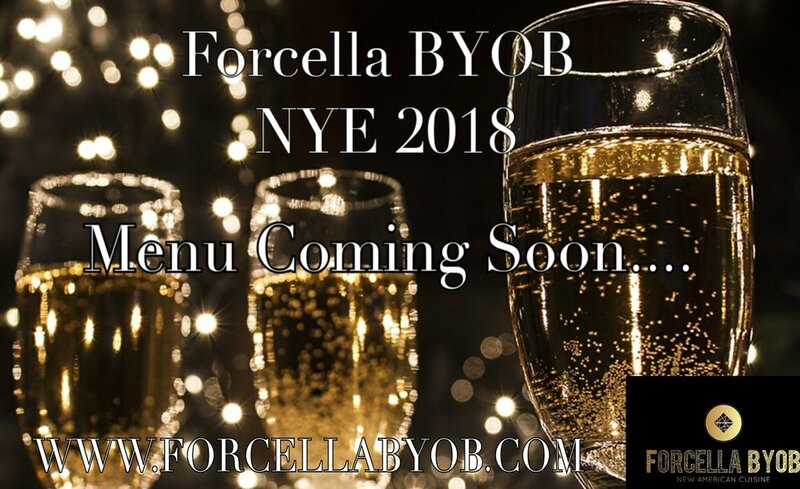 Let us at Forcella BYOB set the stage for your romantic evening with that special someone. We are already filling up. Don't wait til the last minute to book your Valentine's day celebration. To book reservations call 267-400-6155 or visit the reservation section of our site. Greetings from Forcella BYOB. With Valentine's Day right around the corner, we here at Forcella BYOB are almost ready to present our 2019 Valentine's Day menu. Our menu will include 6 gorgeous courses, as well as amuse & intermezzo. We already have reservations booked and will fill up EXTREMELY quickly. Menu will be posted very soon. We hope everyone's new year is off to a fantastic start! To book reservations call 267-400-6155 or visit the reservation section of our site. New Year's Eve will be here before you know it. Don't wait until the last minute to book your NYE dinner plans. We will be featuring a beautiful 6 course menu with amuse and intermezzo. We will sell out very quickly. For reservations call 267-400-6155 or visit our reservation section. Menu coming soon.